This blog post originally appeared as a commentary on the Stanford Social Innovation Review site on December 9, 2014. You can access the original article here. A new report on California highlights how human well-being is a more relevant gauge of progress than economic metrics. African American men in California can expect to live fewer than 73 years—about the same as the life expectancy of men in Tunisia and Vietnam, countries with far fewer health care resources. Meanwhile, Asian American men in California can expect to live 84.4 years, a life expectancy that bests that of men living in global-well-being-nirvana Sweden by four years. These gaps and others as vast within California rival those that separate the richest and poorest nations. Why don’t we know more about these kinds of disparities—disparities in something so fundamental as being alive? Americans hear about Gross Domestic Product growth every quarter, retail sales statistics monthly, and stock market figures every 15 seconds. But those economic indicators measure how the economy is faring, not what life is like for ordinary Americans. Using financial indicators alone as a measure of how well Californians, Americans, or indeed any group of people globally, are doing, is insufficient. Worse, it can give misleading signals. By that score, residents of California’s Kern County, which produced $6.2 billion in agricultural output in 2012 alone, should be thriving. Yet one in three children in Kern County lives in poverty, and Kern ranks near the bottom of the list of California counties in terms of human well-being. Metrics that shed light on the lot of everyday people are more relevant gauges of progress than the purely economic metrics that are a constant focus of our attention today. Some of the benefits of education. Measure of America’s American Human Development (HD) Index measures well-being and access to opportunity in communities across the United States. The index is a composite measure of health, education, and standard of living adapted from the well-honed and widely referenced Human Development Index developed at the United Nations and informed by Nobel Laureate economist Amartya Sen’s capabilities approach. We have applied it to a range of places and groups including US states, congressional districts, metro areas, counties, neighborhoods, and census tracts, as well as racial and ethnic groups and women and men. The results have helped stimulate more fact-based conversations about the challenges faced by communities across the country. “A Portrait of California 2014-2015” is the latest application of the American HD Index. The report provides data-based evidence that people’s capabilities strongly determine their real-life choices and opportunities, either enabling them to live freely chosen, flourishing lives, or constricting their range of possible futures. Health: A baby born today in the neighborhood cluster in Santa Clara County with the highest California HD Index score can expect to live nearly a dozen years longer than a baby born in the Los Angeles County neighborhood clusters with the lowest score. 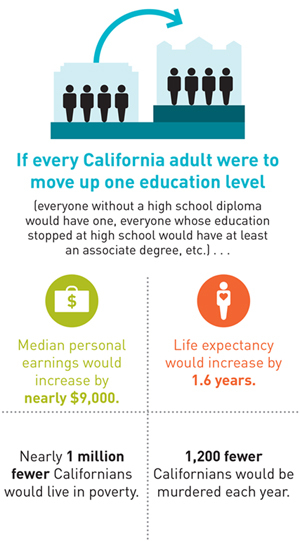 Education: If we could wave a magic wand and increase educational attainment in California by one level for every resident (i.e. those without a high school diploma would have one, those with a high school diploma would have an associate’s degree, etc. ), median personal earnings would increase by more than $7,000, nearly one million fewer Californians would live in poverty, and 1,200 fewer Californians would be the victims of murder each year. In short, education is the closest thing we have to a human development silver bullet. Earnings: California’s farm workers make an abysmal $15,000-$17,500 per year for arduous manual labor few other Americans would sign up for. But UC Davis economist Philip Martin showed that raising those wages by 40 percent would only increase the price of fresh produce for the average American consumer by $16 per year. Crop workers could make a decent wage without reducing access to healthy food in a significant way for consumers—a human development win-win. Health, education, and earnings matter, and making even modest improvements in one area can have a ripple effect across the complete human development spectrum. With that in mind, we have an agenda for action that will help Californians build the capabilities that foster well-being and expand opportunities. Changes in neighborhoods, schools, workplaces, and government can reduce the disparities in health, education, and earnings that divide Californians today and have the potential to raise HD Index scores for everyone—especially groups currently left behind—tomorrow. The main drivers of health disparities are rooted in the circumstances in which different groups of Californians are born, grow up, work, and age—the so-called social determinants of health. This means that improving the health of Californians first and foremost requires improving the conditions of daily life, especially in communities where risks to health are many and varied—including exposure to environmental toxins, violence, excessive alcohol advertising and poor access to healthy foods. In terms of education, evidence is mounting that we are waiting too long to reach out to disadvantaged children and their parents. Increasing access to knowledge in the state requires an approach that starts early in life, beginning with efforts to help at-risk mothers have healthy pregnancies and new parents living in poverty build their caregiving skills, and ensuring access to high-quality childcare and preschool for the children of disadvantaged families. Raising the standard of living requires, of course, reasonable pay for work. Raising the minimum wage and increasing the earnings of farm laborers will change the lives of tens of thousands of families. But we need to address other factors that shape standard of living as well, including the scarcity of affordable housing and protections from unpredictable and unstable schedules for hourly shift workers. What happens in California has national and even international significance for two reasons. The first is the sheer size of the place: One in every eight Americans lives in California, and if California were a country, it would qualify for a seat at the G8. And the second is the state’s demographics: California is America’s most diverse state and on the cutting edge of the demographic changes that will wash across the country in coming decades. “A Portrait of California” thus offers an intriguing glimpse at America’s future. Access the full report here and map the data here.